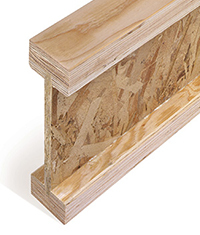 I-joists are strong, lightweight, "I" shaped engineered wood structural members that meet demanding performance standards. I-joists are comprised of top and bottom flanges, which resist bending, united with webs, which provide outstanding shear resistance. The flange material is typically laminated veneer lumber (LVL) or solid sawn lumber, and the web is made with plywood or OSB. The robust combination of structural characteristics results in a versatile, economical framing member that is easy to install in residential and light commercial projects. 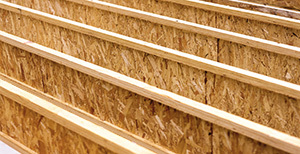 I-joists are used extensively in residential floor and roof framing. They are ideal for long spans, including continuous spans over intermediate supports. Because I-joists are straight and true, it's easier for builders to avoid crowning and maintain a level framing surface. In addition, wood I-joists are typically stocked and readily available in depths that meet the needs of residential framing. 9-1/2", 11-7/8", 14", 16". Flange widths vary from 1-1/2" to 3-1/2"; long lengths are readily available. I-joists are popular for floor and roof framing. Many APA member-manufacturers have software design tools; contact the manufacturer (at left) for more information. APA Performance Rated I-joists (PRIs) are manufactured in accordance with PRI-400, Performance Standard for APA EWS I-joists, Form X720. This Performance Standard provides an easy-to-use table of allowable spans for applications in residential floor construction, allowing designers and builders to select and use I-joists from various member manufacturers using just one set of span tables. APA PRIs are recognized through ICC-ES ESR-1405. APA trademarks appear only on products manufactured by APA member mills. The mark signifies that product quality is subject to verification through APA audit—a procedure designed to assure manufacture in conformance with APA performance standards or the standard shown in the mark. Includes information on Span Ratings, installation details, cantilever designs, architectural specifications and engineering design properties for APA Performance Rated I-Joists. 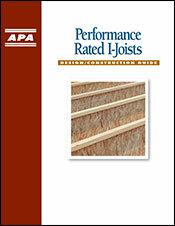 Access a complete list of APA publications about I-joists in APA's Resource Library. Learn about several options that enhance the fire performance of I-joist floor systems and comply with the 2012 and 2015 International Residential Code (IRC) by visiting the I-Joist Fire Assemblies page. APA, AWC, and WIJMA jointly developed this paper that describes the history, background, and intent of the IRC provisions for fire protection of floors as well as the methods used for establishing equivalence and compliance with these fire protection requirements. APA, AWC, and WIJMA jointly developed this paper that describes the basic code recognition for prefabricated wood I-joists and the need for product certification in compliance with the codes. APA developed this paper that describes the basic fire protection requirements for prefabricated wood I-joists with factory-applied fire protection solutions for compliance with the codes. Boise Cascade Company Roseburg Forest Products Company LP EACOM Timber Corporation Nordic Structures International Beams Pacific Woodtech Corporation Stark Truss Company, Inc. Pinkwood Ltd.
PR-L310: Boise Cascade Wood Products LLC. ESR-1251: Roseburg Forest Products Co.
PR-S223: Stark Truss Company, Inc.
PR-S201: Boise Cascade Wood Products L.L.C.